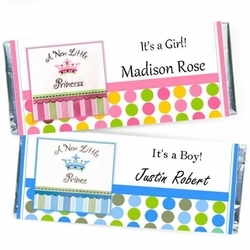 You will love handing out these beautiful Birth Announcement Candy Bars! What a great way to let all your friends and family know about the new addition to your family! Our designs are fun and festive, and a perfect way to give everyone the stats! There is no sweeter way to get the word out then with a delectable chocolate bar. Order the WRAPPERS ONLY. We provide the SILVER FOIL underlay and PERSONALIZED WRAPPERS! *This is for the do-it-yourselfer. We do NOT provide the Hershey candy bars!! *Our wrapper/foil combo will fit 1.55 oz "Regular" Size Hershey's® bars! *Assembly is required *To sum it up: YOU buy the chocolate bars, YOU wrap bar with silver foil provided then wrap with your adorable personalized wrapper. Order the fully WRAPPED CANDY BARS. We will do the work for you! 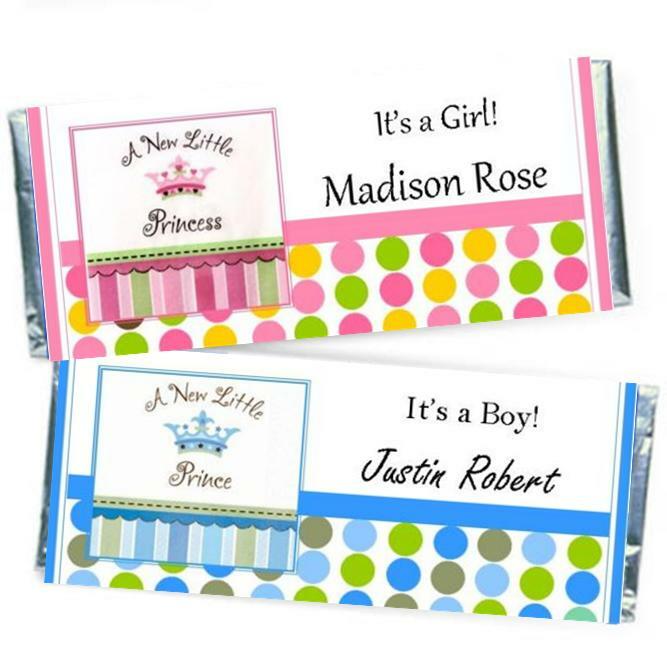 Your Birth Announcements will arrive to you all ready to hand out.